There are 17 reviews of Mon Guerlain Eau de Parfum. I wear this to work because I know it's not going to p*** anyone off. Well-made, sweet, classy and inoffensive, but absolutely nothing new. I mostly get vanilla get pink, fuzzy vanilla. Can reapply through the day without drowning in it. Usually I like to wear a perfume for a while before reviewing it. I have only been wearing Mon Guerlain for a few days but this time I wanted to register some initial impressions while they’re fresh. Mon Guerlain is aptly named because that’s exactly the impression the first whiff made: “Hi, I’m a Guerlain.” It somehow even today manages to exude notes evoking the signature Guerlain accord—like bergamot, vanilla, coumarin—and starts with a breezy lavender tip of the hat to Jicky. Middle notes could vary and still keep the house vibe. in this case jasmine, rose and iris were used—right down the middle of perfumery tradition. Mon Guerlain surely contains its share of modern aromachemicals to claim a place in today’s olfactory style but not so as to detract from its lineage. The whole effect as it dries down in a powdery oriental cloud is to create an elusive and yet recognizable aura around the wearer. With an emphasis on Guerlain signature notes and the inclusion of easy-to-wear floral and modern elements it could possibly fill the role that the unfortunately discontinued Shalimar Parfum Initial failed to do; i.e., act as a gateway scent to the world of Guerlain. I like it for its carefree classiness. It’s like Mon Guerlain is a perfume spanning three centuries: top notes of an oriental-fougère Jicky vibe from 1889, classic 20th century floral rose-jasmine-iris heart, and trendy 21st century vanilla-musc drydown. I wonder if this seeming time-span effect was a conscious plan. No doubt Guerlain has spent a good part of the past 15 years or so trying to keep its name at the forefront of the collective mind of the mass perfume-buying public. Which is fine. Even the French have to send their kids to college, and they can’t do it on the strengths of Mitsouko and Shalimar alone. And it hasn’t been all bad. L’Instant and Insolence are very good, though I don’t own them. And Parfum Initial is in my opinion great. Also targeted for mass appeal, you bet, but it didn’t insult those masses. It gave them a beautifully updated and almost humorous riff on a classic that at the same time managed to throw off tons of modern sparkle and charm. That Guerlain pulled the plug on PI after only a few years (as they do with all Shalimar flankers, most of which range from very good to drop-dead great), sending yet more 'fume freaks scrambling over to the ‘Bay to hoard bottles, makes me wonder if Wasser and Co. don’t suffer from some kind of attention deficit disorder. And maybe, at this point, an inability to innovate? Seriously, does the world really need Mon Guerlain, yet another well-made but inoffensive scent? Perfectly fine, sure, but also perfectly generic, perfectly redundant, and perfectly calibrated to be as easy-to-grasp as every paint-by-number juice that hits the counters these days. A hit of something citrus up front, followed by an iris that momentarily echoes that of Parfum Initial’s, some lavender to tone down the sweetness, some musk to keep it clean, and enough vanilla in the dry down to hit that perfect pastry note, since it seems that everyone these days wants to end up smelling like a donut. I laughed when I saw that Angelina Jolie is the spokesperson. Really? I’d be embarrassed if I were her. Don’t mind me, though. Mon Guerlain is probably selling like gangbusters. This scent is so elegant, feminine and lovely! The opening is fresh and floral with lavender, jasmine and bergamot. Then it turns into a delicate, soft, delicious scent, warm, powdery, cozy, slightly sweet. The lasting power is good, the sillage is divine. Absolutely marvellous, one of the best vanilla fragrances. Mon Guerlain has been welcomed as a gift by our 16-year-old daughter as her first fragrance. Many other fragrances from luxury houses were tested, however, nothing else clicked like Mon Guerlain. The notes and ingredients deserve appreciation. The notes can be seen as consistent with the artistry and humanitarian work of Angelina Jolie. A search on Youtube shows that Mon Guerlain is rated as the best girlfriend fragrance by guys, including Jeremy. 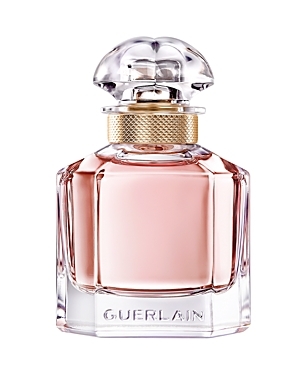 IMHO, Guerlain has made the creation of a modern interpretation of femininity in a very popular scent look EASY, though of course, making it look easy requires a master perfumer. Guerlain Mon Guerlain Eau de Parfum 3.4 oz. Mon Florale by Guerlain Eau De Parfum 3.4 oz /100ml For Women Brand New! Tester! There are no member images of Mon Guerlain Eau de Parfum yet. Why not be the first?